Because we’re in the business of staying up to date on the latest market trends and opportunities for our clients, we have fun keeping tabs on different search terms or keywords and seeing what they may reveal about the economy, consumer interests, and more. 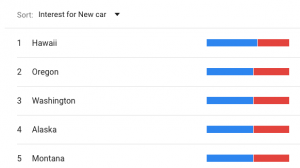 We took a look at the keywords, “new home,” and, “new car,” to see if we could find any patterns or correlations between the two. You can see the graph below. This graph shows searches for “new homes” (blue line) and “new cars” (red line) from October 2013 to November 2018. Generally speaking, search volume is similar, and there seems to be a correlation right after Christmas where the search terms’ volumes increase. Every holiday season, there is a dip from October through Christmas, and then a major spike right after Christmas. In addition to time of year, the top five states that search for “new car” are states that tend to see more snow, rain, or severe weather. Fewer people search for and buy new homes and new cars before the holidays. This is a huge spending quarter in the e-commerce sphere, so it makes sense that more personal purchases, like new homes and cars, would dip. But why does it spike right after the holiday season? The whole “new year, new you” mantra could have something to do with it. Once the holidays are over, people are looking to the new year to reach their goals and plan out their future. It’s also an interesting point that one of the best weeks for buying a new car is the week between Christmas and New Year’s. This is because dealerships are trying to meet sales quotas before the beginning of a new fiscal year. In January, when everyone is recovering from post-holiday debt, dealerships are also likely to sell their vehicles for cheaper. According to Nerdwallet, January and February are the best time to buy new homes, as they typically cost up to 8.45 percent less than other months. Finally, tax refunds generally start coming in in February, so some consumers may feel like they have the extra income to put toward a down payment on a home or car. The top five states that search for “new cars” are in areas that see more rain, snow, or have rougher terrain, like mountains. Buyers who live in these states may feel as if they need a more reliable vehicle than if they live in a quieter weather region or an area with flatter terrain. Depending on what business you’re in, you might be able to find interesting opportunities with this information. If you are a homebuilder, you may be able to take advantage of the holiday season by using the momentum in the market to build relationships that help you sell. Car dealerships can benefit from this information because they can see that it’s wise to spend extra ad dollars after Christmas to help reinforce consumers’ wants. More post-holiday deals could lead to more sales for them. It’s also important for buyers to make these connections, because that will help them get the best deal for their money. We’re always looking for new market trends and keyword research, so keep your eye out for more Keyword Watch articles, and let us know in the comments if you have any trending keyword ideas!